What Do Ground Moles Eat? Moles are family Talpidae animals who reside in burrows underground. They rarely emerge from their cozy abodes down in the dirt, where they feast predominantly on creepy crawlies. Moles are noteworthy not only for their penchants for eating insects but also for their miniscule eyes, sturdy physiques and short limbs. Moles are generally insectivores, with various exceptions. Their feeding plans are made up of the many invertebrates -- including insects -- they come across while digging around in the soil. 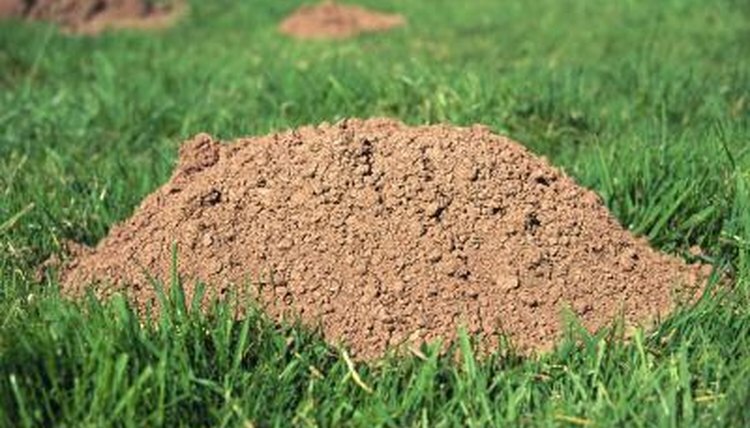 Moles across the board frequently consume insects of many varieties, including those who inhabit the water. Beetles, for one, are often a major component of their diets. The independent animals also often eat the larvae of insects such as caddisflies, order Trichoptera. Outside of insects, moles consume lots of invertebrates in general. Star-nosed moles (Condylura cristata), for example, enjoy dining on invertebrates in the water. When these moles are close to water, they actually favor creatures such as leeches. Star-nosed moles are highly adept at swimming. They also regularly make meals out of mollusks such as slugs. Arthropods occasionally make appearances in mole dietary plans, specifically centipedes and spiders. Some moles even dine on bigger critters, notably vertebrates like rodents and reptiles. Tiny fish are a typical meal. Although the mole diet mainly consists of animals, certain species of moles occasionally make room for plants, too, although in tiny portions. They are more likely to eat plants that have taken on a mushy texture due to moisture. Insects are undoubtedly mole nutritive staples, but they're not actually their first priority. Large earthworms are actually what moles generally like to eat the most. Moles consider earthworms to be so valuable they regularly stash them away for later consumption. If they have an earthworm surplus, they tuck them away inside designated safekeeping units. One researcher found a unit consisting of more than 1,200 earthworms. The unit also housed several grubs. Moles possess extremely speedy metabolisms. Because of this, it's absolutely crucial for the subterranean mammals to take in substantial portions of food daily. If they don't, they simply can't sustain themselves. Moles generally consume between two and three times their body weights every 24 hours. Moles are unable to survive without eating for 12 hours or so. What Is the Hyena's Diet? What is in a Warthog's Diet? What Do Desert Iguanas Eat? What Do Side Blotched Lizards Eat? Why Is the Armadillo's Nose Important? Why Do the Mole Crickets Live Underground? What Are the Different Snapping Turtles in Texas? Do Armadillos Have Good Hearing?